So, after all those months, how are things now? I already posted an update in previous blog, but today I’m going to go deeper. As I wrote back then, this game has a scheduler but no stat raising. 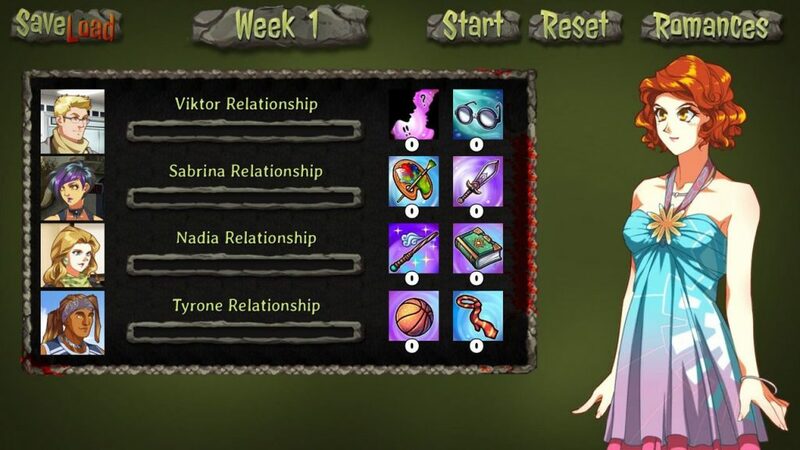 The relationship bar is increased simply by spending time with each character, it’s not influenced by the choices. The things I said in that blog post are still valid, but using the image above I want to explain how the different endings work. So in summary each character has two possible… let’s call them “variants”. Viktor for example has Social and Nerd. Sabrina has Artist and Huntress. Nadia has … wait, I don’t want to spoil the fun! Anyway, with your choices in the dialogues, you’ll influence the character (for example by making Viktor more sociable, or on the opposite by pushing him to take advantage of his nerd side). Those values will determine, at end of the game, which ending you get (beside the romance ending and CG which are fixed). Probably better call it epilogues, more than endings. Here’s the mystery of those hidden variables explained! I already posted a few on twitter, but here I’ll post a male and a female one to be fair! 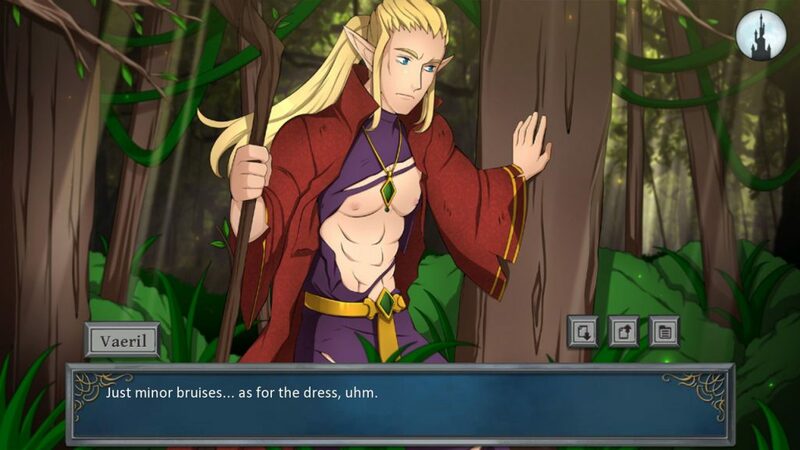 Vaeril trying to get through a forest and, ops, his precious dress is scratched open! Well, considering he’s a druid he’s in good shape, don’t you think? What are those bonus CG? Simply said, after the big success of Amber pin-ups, I decided to add some more for this game. As you probably should know, the original artist is the same who did Loren art and sadly he doesn’t work for me anymore. So I had to use someone else, but that has a style similar enough I think. In any case, the result is good in my opinion. Those CG are used in two ways: to illustrate a scene already in the main romance story, or to illustrate two bonus scenes when the player is a couple with the love interest. Indeed, a big difference vs all my previous games, it’s that in this one if you want you can sleep with more than one character in the same playthrough – yes, unlock the “final romance CG” with more than just one character. Of course, this is not without consequences ! In this case the usual “jealousy scene” will trigger and you’ll need to pick one love interest. After you choose the love interest, all other romance routes are blocked, but as “reward”, you get two more bonus scenes with him/her, as couple (another thing that was missing in my previous games). Plus of course there’ll be the ending epilogues which will change based on this (and also on other choices in the game but that I can’t reveal because are big spoilers!). The game script as predicted it’s already 200,000 words now, with many boss fights missing and all the endings/epilogues yet to write. I wouldn’t be surprised if the final script will be around 230-250,000 words. Yes, another SMALL GAME ™! In conclusion, I really hope that you’ll enjoy both games when are out, because as usual they’re big, with lot of content, very replayable, and we’re putting a lot of efforts in making them ! This entry was posted in Cursed lands, dating sims, love bites, roleplay games. Bookmark the permalink. Yes apart of Leena (obviously since she’s an amazon) and Jasper. All the others are bisex now. OK, and another thing, I just read on your forum that you’re posting your games on itcho (did I write that right? Never used that site before) dies that mean we can’t buy games from directly your site anymore? 1) If you buy games from this site (as opposed to steam) will they be not edited or censored? Is it more beneficial for Winter Wolves if i buy directly form this site? 2) How does one get Love Bites and Cursed Lands? I already own Heirs and Graces so i am excited to try some of the other games. Yes if you buy direct, the payment processor takes a much smaller fee: around 10% vs the 30% of Steam, so a noticeable difference for me 🙂 The ones on my site are always the uncensored versions. For Love Bites and Cursed Lands I was waiting to have more content before putting the pre-orders. I have done pre-orders before but personally I don’t like to take people’s money before I have at least a playable demo of the game 🙂 I think at least one of the two should be in pre-order before end of year though, I’ll announce it on social media and my blog! Will we still get a steam key if we buy through you? Also any way to uncensor the steam/mobile versions? Yes you get a Steam key for free if you buy direct. The Steam version now works the same as the one on my site (currently it’s still in beta branch though). For mobile unfortunately it’s not possible (adult content it’s against their policy so I risk that they remove my game from the store!). Sorry but I can’t do anything about it. Looks interesting! I don’t remember you mention it before, so I curios – who is the Cursed Lands writer? Is it someone who worked on your other games or someone new? No it’s someone new 🙂 As far as I know this is his first time working on a game in general. I noticed you said “As you probably should know, the original artist is the same who did Loren art and sadly he doesn’t work for me anymore.” and I must admit I loved his art. He did Seasons of The Wolf as well. Is there no chance he’ll work for you again? Is Cursed Lands not going to be finished by him then? I haven’t heard from him in 3-4 years…so I really think not. The Cursed Lands art was done back in 2014. When I understood he wouldn’t be working for me for much longer I had him do a bunch of art for future games, like this one or Loren 2. The art for CL is all ready though. I only had to use another artist to do the bonus CG I spoke about in this post (the Nuala/Vaeril CG you see are done by another artist).